After the pelletizing process, the pellet is in the most vulnerable stage because of its high temperature and moisture. The pellet must be fed into a cooler right after the pelletizing process to reduce its temperature and moisture and regain a better rigidity for package, transport and storage. Otherwise, the pellet may be easily destroyed during the process. Typically, there are three types of pellet coolers in the market, the horizontal type, vertical type and the counterflow type. GEMCO provides counterflow pellet cooler for the industrial pellet production line, which is considered to be the most advanced cooler for the biomass pellet industry. Gemco counterflow cooler is widely applied in industrial biomass pellet production lines and large feed mills. The pellet which is discharged from the pellet mill maintains a temperature about 80-90℃ and a moisture about 17-18%. Ideally, after the cooling process, the temperature of the pellet is no more than 5℃ higher than the room temperaure, and the moisture will be reduce to 12-13%. Nomally, the counterflow cooler is consist of the engine, a rotating feeder, a taper distributor, a cooling chamber, a suction system and a collection hopper. After the pellets are discharged from the pellet mill, the rotating feeder will feed the hot pellets into the cooler, and the taper distributor will distribute the pellet evenly into the cooling chamber. Inside the chamber, the cold air takes an opposite direction with the pellets entering, it flows from the bottom to the top. Therefore, the cooler pellets contact with the cold air first, and after the initial contact, the air is warmer, so the warmer pellets contact with the warmer air. The counterflow principle can control the temperature variations between pellet and cold air, and provide stable quality pellets by avoiding the pellets with a cooled surface and moist interior or the pellets with a craked surface. 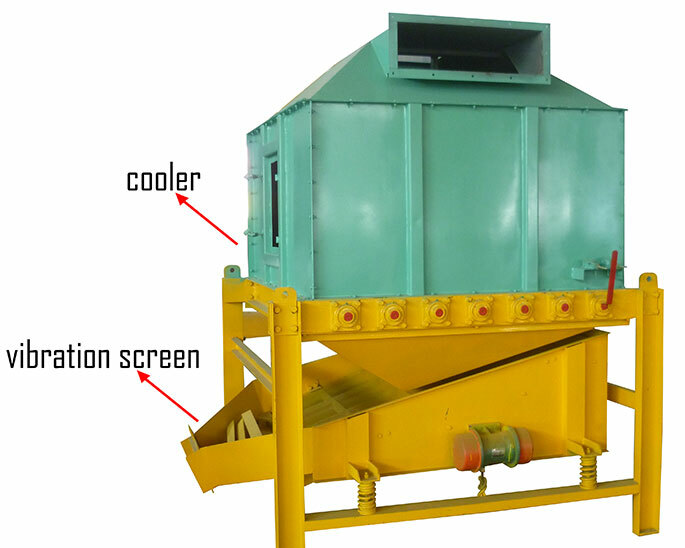 After the cooling process, the cooled pellet will be discharged by the suction system. Well-proportioned and efficient cooling performance, which is ensured by an octagon cooling bin. Low powder residues, which is ensured by a slide valve reciprocating discharging device. High cooling efficiency and no cross contamination, which is ensured by a sealed air entry system. Multiple choice, a turnover type discharge device, and hydraulically control system are optional. The fan and air-lock must be started before the cooler starts working. Higher capacity requires high position of the level indicator, please adjust the position of the level indicator according to your capacity. During the working process of the cooler, never open the observation door! When the cooler stop working, please use the hand switch to discharge the cooled pellets. In order to transport easily, GEMCO counterflow cooler is seperated to some parts, if you need a further information about transportation, contact GEMCO, we will get back to you immediately!